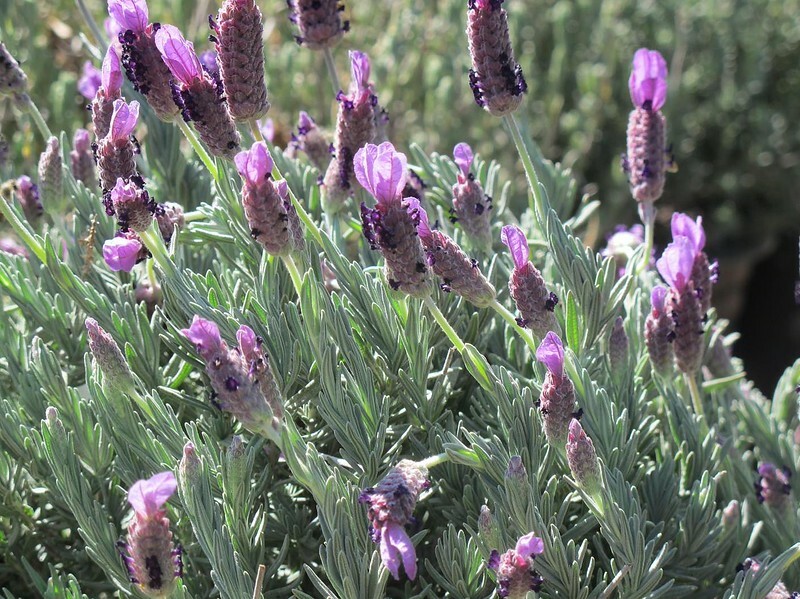 Lavandula stoechas 'Otto Quast' (Spanish Lavender) - This selection forms a dense 1 to 2 foot tall by 2 to 3 foot wide shrub. It has gray-green 1 inch long lanceolate leaves and short unbranched inflorescences bearing tight flower spikes of small purple flowers crowned by several 1 inch or larger purple petal-like bracts-(the bloom reminds some of a small purple pineapple). It blooms most of the year with strongest flowering from April to August. Plant in full sun in a well-drained soil. This plant is relatively drought tolerant and only requires occasional irrigation; hardy to 5 degrees F.